Researchers used Subaru Telescope's planet-finder camera, HiCIAO, to take a crisp high-contrast image of the dust ring around the young nearby star HR 4796 A. The resolution of the image is so precise that an offset between the ring's center and the star's position can be measured. The Subaru data reveal the offset to be larger than previously assumed. The image contributes to our understanding of the link between disks and planet formation. An international team of astronomers led by Masami Ouchi at the University of Tokyo has discovered a vigorous, star-forming galaxy that existed about 750 million years after the Big Bang. This galaxy, named GN-108036, was a remarkable source of star formation at the so-called "cosmic dawn", a very early time in cosmic history; it was generating an exceptionally large amount of stars in the calm, dark cosmos. Subaru Telescope has added another dimension of information about one of the most studied of all compact galaxy groups―Stephan's Quintet. Located within the borders of the constellation Pegasus, Stephan's Quintet consists of a visual grouping of five galaxies, four of which form an actual compact group of galaxies; one additional galaxy appears in images of the group but is much closer than the others. Refinements in observations of the quintet are revealing more about its members. A comparison of images compiled by using a suite of specialized filters with Subaru's Prime Focus Camera have shown different types of star-formation activity between the closer galaxy NGC 7320 and the more distant galaxies in Stephan's Quintet. They show the quintet in 3-D.
A research team of planetary scientists and astronomers, primarily from Seoul National University, the National Astronomical Observatory of Japan (NAOJ), the Institute of Space and Astronautical Science (ISAS), and Kobe University, has explained the formation of peculiar triple dust tails from the asteroid Scheila (asteroid #596). The researchers concluded that another asteroid about 20-50 meters in size impacted Scheila from behind on December 3, 2010 and accounted for its unusual brightness and form. An international team of astronomers has discovered over two-dozen new free-floating brown dwarfs that reside in two young star clusters. One brown dwarf is a lightweight youngster only about six times heftier than Jupiter. What's more, one cluster contains a surprising surplus of brown dwarfs; it harbors half as many of these astronomical oddballs as normal stars. These findings come from deep surveys and extensive follow-up observations using the Subaru Telescope in Hawaii and the Very Large Telescope (VLT) in Chile, two of the world's largest optical-infrared telescopes. A research team of astronomers, mainly from Ehime University and Kyoto University in Japan, has successfully detected a carbon emission line (CIVλ1549) in the most distant radio galaxy known so far in the early universe. Using the Faint Object Camera and Spectrograph (FOCAS) on the Subaru Telescope, the team observed the radio galaxy TN J0924-2201, which is 12.5 billion light years away, and was able to measure its chemical composition for the first time. A team of Japanese, Israeli, and U.S. astronomers used the Subaru Telescope to assemble the largest sample ever found of the most distant exploding stars called supernovae, which emitted their light about ten billion years ago, long before the Earth was formed. The researchers used this sample of ancient supernovae to determine how frequently such explosions of stars occurred in the infant universe. A research team of astronomers from the University of Tokyo and the National Astronomical Observatry of Japan (NAOJ) has identified the location of red star-forming galaxies around a galaxy cluster situated four billion light years away from Earth. A panoramic observation with the Subaru Telescope yielded the result. Scientists surmise that such "red-burning galaxies" are in a transitional phase from a young generation of galaxies to an older one; they may demonstrate the dramatic evolution of galaxies in the environment surrounding the cluster. A research team at NAOJ has begun scientific observations with Subaru Telescope's Laser Guide Star Adaptive Optics (LGSAO) system. The LGSAO uses a powerful laser to illuminate the sodium layer of the atmosphere and create an artificial guide star that shines in the upper atmosphere. The LGSAO system integrates the creation of an artificial guide star with adaptive optics that compensates for atmospheric turbulence. This integrated system delivers to the scientific instruments images that are ten times sharper than previous ones. Consequently, it will facilitate discoveries of new objects and clarify the details of other faintly observed ones. A team of researchers from four Japanese universities (Kobe, Saitama, Osaka, and Tokyo) has been able to delineate the intricate structure of the circumbinary disk that surrounds a young binary star system from the observation with the Subaru Telescope and the Hubble Space Telescope. By using different wavelengths to examine the system's internal structure, they succeeded in demonstrating a distinct color difference between its northern and southern portions. The researchers are now prepared to apply their approach of combining optical and near-infrared observations to other regions of binary formation. 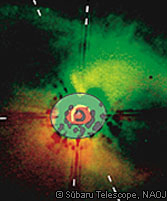 Recent results obtained with the Subaru Telescope appear in nineteen papers in a special, March 2011 issue of PASJ entitled "Exploring the Universe with the Subaru Telescope: From Galaxies to the Solar System". This notable issue spans wide areas of astronomy, ranging from the Solar System to distant galaxies. The papers not only reflect the versatility of the Subaru Telescope but also its contribution to recent trends in astronomy. A Japanese research team has used mid-infrared cameras mounted on the Subaru Telescope as well as on the Gemini South telescope to observe samples of many infrared bright, merging galaxies. Observations revealed that some samples show characteristics of rapid star-formation, while others display the signature of active galactic nuclei that draw their energy from active supermassive black holes deeply buried in their centers. An international team of astronomers has used a combination of space and ground-based telescopes, including the Subaru Telescope in Hawaii, to discover and study the most distant mature cluster of galaxies yet found. Although this newly found cluster existed when the Universe was less than one quarter of its current age, it looks surprisingly similar to full-grown galaxy clusters in the current Universe. The Subaru Telescope, fitted with its instrument COMICS, has produced a new image of the interior of the famous starburst galaxy Messier 82 that reveals young star clusters as well as the sources of its superwind in spectacular detail. The ultra-sharp image contributes to our understanding of this complex, young galaxy by showing that M82's galactic windstorms emanate from many sites rather than from any single cluster of stars. An international team of researchers led by Ichi Tanaka from the National Astronomical Observatory of Japan has discovered an aggregate of galaxies undergoing a burst of star formation that may hold the key to understanding how galaxies formed in the early universe. The aggregate is located toward the Constellation Vulpecula and is 11 billion light years away, 2.7 billion years after the birth of the universe, when it was still in its infancy. The fruits of the SEEDS Project, led by Motohide Tamura at NAOJ , are accumulating. Composed of over 100 scientists and 25 institutions, the international consortium of researchers supporting the project has announced another set of stunning findings obtained with the recently commissioned Subaru instrument HiCIAO , an upgraded version of its predecessor CIAO. Their initial announcement of a significant discovery came in December, 2009: an exoplanet candidate around a Sun-like star. Now they are announcing another remarkable discovery: direct and sharp images of the protoplanetary disks of two young stars that reveal how planets may have formed within them. No other telescopes, whether ground-based or in space, have ever penetrated so close to a central star, showing the details of its disk. A research team led by astronomers from the University of Tokyo and the National Astronomical Observatory of Japan has discovered that inclined orbits may be typical rather than rare for exoplanetary systems -- those outside of our solar system. Their measurements of the angles between the axes of the star's rotation and the planet's orbit of exoplanets HAT-P-11b and XO-4b demonstrate that these exoplanets' orbits are highly tilted.